Bring an air of Ivy League distinction to any traditional home or professional office setting. A beautiful hardwood Mahogany frame, timeless brass trim accents and durable vinyl upholstery make the Ivy League Captain a must-have addition. Available in classic black or a rich burgundy finish to match any decor. 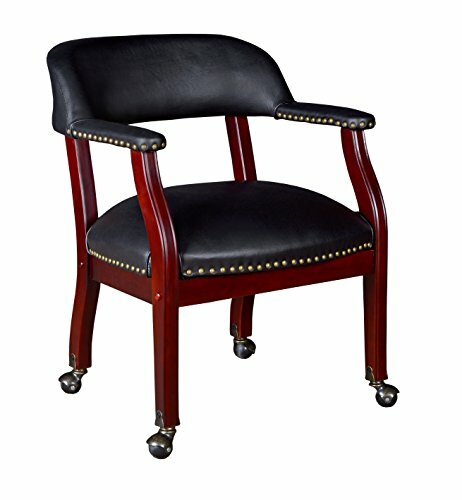 This attractive chair moves around easily on durable brass casters. The Captain chair looks great in libraries, studies and waiting rooms, too. All Regency chairs are backed by a 5-year limited manufacturer's warranty on chair bases and frames and a 2-year limited manufacturer's warranty on chair mechanisms and upholstery.